From the Key Stages of learning to your Career in Engineering. In Year 9 you will have two lessons per week over the year. 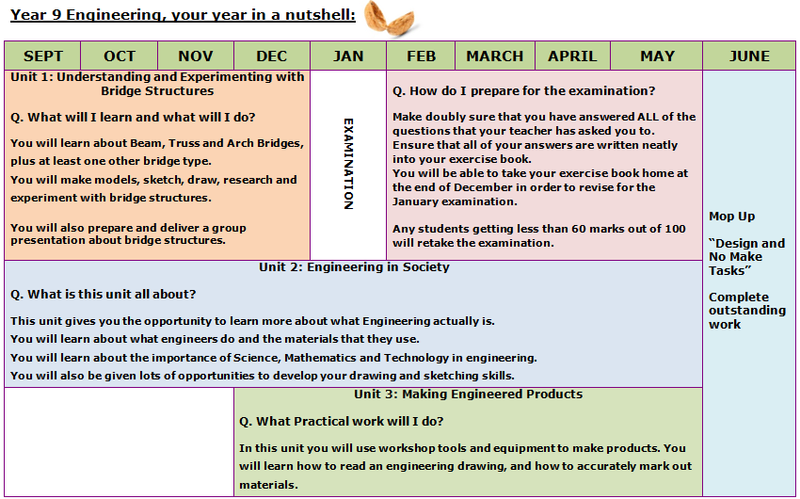 There are three units of work to complete; each designed to help you develop engineering knowledge and skills. Keep a lesson by lesson diary that will show your progression throughout the year. Be regularly tested and assessed. Complete tasks and upload evidence for assessment in the google classroom environment. Learn about bridges and make models. Learn how to follow and read an engineering drawing. ‘Engineer’ a product or products using tools and equipment. Learn how principles of mathematics, science and technology are used by the engineer (stem). Carry out a ‘Make and no design task’, ‘Design and make task’, ‘Design and no make task’ and a ‘Group presentation task’. Your safety and that of your peers is very important in Paignton Academy, and it will not be compromised due to any poor behaviour. Follow the workshop rules. Always have respect for your own safety and the safety of everyone around you. This website is being continually developed for Engineering students at Paignton Academy. To encourage young people to take an interest in Engineering and develop an informed opinion of what engineering is. To encourage young people to follow a career that benefits the society in which they live. Engineering is not just about oily rags and engines! Engineering is not just a career for boys! Girls have ALL of the skills required to become amazing Engineers.